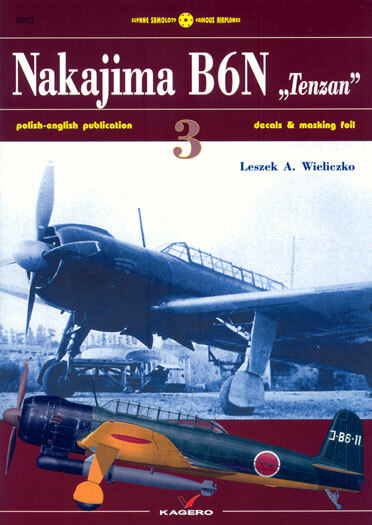 Nakajima B6N 'Tenzan' (Heavenly Mountain) is the third book in the Famous Airplanes series of from Kagero, a Poland based publishing company. The Nakajima B6N 'Tenzan', (codenamed "Jill" by the allies) was a single engined three place carrier based torpedo bomber that was designed as a replacement for the Nakajima B5N "Kate". The book is in both Polish and English languages. Each page is split into two columns. The left hand column is printed in the Polish language and the right hand one in English. The captions to the photographs as well as the colour artwork receive a similar approach with the polish language first followed by the English translation. Other books in the Kagero range follow a similar format. Some of these suffer from quirky translations from the Polish to English but I'm happy to say that this is not one of them. It is logically laid out with sections on the design development and production, operational usage, painting and markings, and a technical description of the aircraft. Each section is very informative but I have to say that the operational usage and painting ones stand out. Information on how Japanese naval aircraft, let alone the Jill, were painted is not all that easy to come by, happily though the section guides you through the interior colours as well as the propeller, spinner and upper and lower surfaces. Markings worn by the Jill are also fully explained. The book is illustrated with black and wartime photographs as well as a couple of post war ones of the machines that were tested in the United States following the war's end. Each of the photographs is captioned and identifies which unit the machine belonged to. The hard-bitten fan of Japanese Naval aviation will be familiar with some of the photographs but there are quite a few new ones amongst them. Colour is in the form of profiles of eleven different machines (painted by Zygmunt Szesementa). A decal sheet is included with the book. 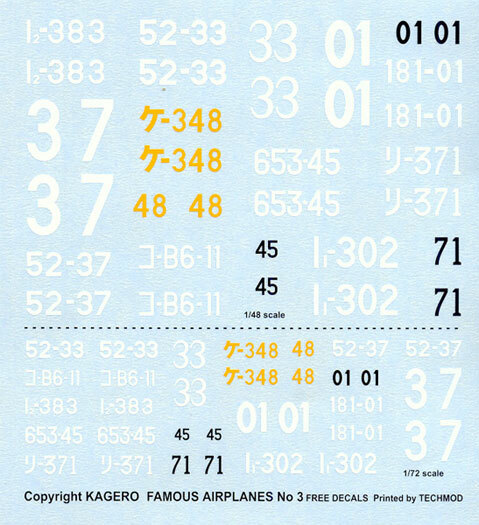 The decals are in both 1/72 (for the Fujimi kits) and 1/48 scale (for the Hasegawa kits) and are printed by Techmod. Techmod decals are very nice but require care when applying. Use plenty of water to float the decal to where you want it and you won't have a problem. Markings are offered eleven different machines (the same ones as the colour profiles). No hinomarus are provided but these are not too hard to find elsewhere. Thankfully, Kagero has chosen not to replicate the markings found in the 1/48 scale Hasegawa kit as they are quite useable. The final offering in this package is a set of 1/48 scale vinyl canopy masks designed to fit the Hasegawa kit. Nice touch this as it saves an evening's worth of struggling with masking tape to mask the Jill's huge greenhouse. The decal sheet and masking set is packed into a sealed plastic bag that is placed into a plastic mount on the inside of the front cover. The book is B5 in size (a little smaller than the Osprey Aircraft of the Aces series). It consists of 36 pages printed on glossy paper between cardboard covers. Good stuff from Kagero and definitely worth the asking price as you get clear well written text as well as a decal sheet and a masking set.